In her song Louisiana Bride, singer, alto saxophonist, harmonica player, songwriter, and bandleader Paula Rangell sings, “Down in South Louisiana / Way over in the hills on the Northshore / A little house stood one hundred years in the woods / Where my husband’s mother was born.” Today, Paula lives in that little house outside Covington, Louisiana, with her husband Chuck Fowler, and it is her dedication to performing hard-driving, funky, electric post-war blues and R&B with Paula and the Pontiacs that led her there. Paula will celebrate her fortieth year in the driver’s seat of the Pontiacs in 2018, and it hasn’t always been an easy road to travel. Yet, her absolute mastery of the idiom has begun to garner her some laurels. In 2016, she received the annual Slim Harpo Music Award in the Pioneers category, which recognizes “one who has endured and carried blues music forward.” That description perfectly fits four decades of leading Paula and the Pontiacs. Also in 2016, Paula’s recording of Harmonica Girl was selected as the lead track for the critically acclaimed two-disc set Blues Harp Women (Ruff Records). So for 2017, Paula looked back over that long blues highway and put together 17, a compilation of seventeen original songs culled from her three studio albums, Cadillac Love, 30 by 90, and Louisiana Bride. Although neither of her parents was particularly musical, Paula, who was born in Little Rock, Colorado, and her three brothers all became professional musicians. Andrew Rangell received his doctorate from Julliard and is an acclaimed classical pianist based in New York. In 1980, after years of performing jazz and blues in the Denver/Boulder area, saxophonist and flutist Bobby Rangell relocated to France and remains an integral member of the Paris jazz scene. Nelson Rangell, also a saxophonist and flutist, initially made his mark as a smooth jazz stylist in the late 1980s, including an association with Dave Grusin. Bobby, Nelson, and Paula come together to perform on the song she wrote for their father, I Got It All From You. Paula began her musical studies on clarinet but switched to saxophone; one of her seminal muses is Charlie Parker. However, she was drawn to the down-home blues through rockers like Janis Joplin and Jimi Hendrix and taught herself to play harmonica. Eventually, she discovered the music of blues giants like Muddy Waters, Elmore James, and Sonny Boy Williamson II (whose Pontiac Blues provided the inspiration for her band’s name). As a singer, Paula was stirred by the soulful, emotive stylings of legends like Billie Holiday, Ray Charles, and Aretha Franklin. A major step forward came in the late 1970s in Boulder when she joined the bluesy “jug rock” band The Beegle Boys, led by veteran guitarist, singer, and songwriter Rob McLerran, which also featured fellow New Orleans-based blues man Washboard Chaz Leary. Playing with McLerran enabled her to work with a master songwriting craftsman and also provided her with valuable experience in how to run a band and the inner workings of the music business. In 1978, Paula found a rehearsal space in an old garage on “The Hill” in Boulder and put the first edition of the Pontiacs together. Their repertoire consisted of hard-core Chicago blues and funky R&B. Once she hit the road, she never looked. In 1980, she moved on to the bustling Austin scene, where she added some Texas blues flavoring to the mix. One of the most satisfying musical friendships she made there was with jazz/blues Territory Band legend, bassist Gene Ramey. Finally, in 1984, she headed east on I-10 to New Orleans and found a place for the Pontiacs in the city’s percolating R&B scene. One thing that can be said about Paula is that musicians recognize that she’s a hip player, that she’s downright soulful, and that she has bona fide chops and a whole lot of experience. In New Orleans, she forged musical friendships with artists like John Mooney, Deacon John Moore, and Earl King, who once declared: “Paula knows her blues and she can really groove.” Paula established herself as an insider on the New Orleans and broader Louisiana roots music scene. She has performed at the Jazz and Heritage Festival and the Crescent City Blues and BBQ Festival. The Pontiacs were regulars at the fabled after hours gigs way Uptown at Benny’s Bar. And, she performed a solo saxophone gospel number at the wake for R&B legend Ernie K-Doe. She was able to honor one of her heroes as a member of the "Louisiana Music Hall of Fame Little Walter Legends" for the inaugural 2103 Little Walter Music Festival in Alexandria, Louisiana. And, at times she has taken the Pontiacs out on the road for gigs ranging from the King Biscuit Festival in Helena, Arkansas, to shows in São Paulo, Brazil. After moving to the Northshore, she began working at all kinds of back road joints out in rural Louisiana, and her Live At Ruby’s Roadhouse (2000) is a rocking document of an incendiary blues and R&B show by Paula and the Pontiacs. 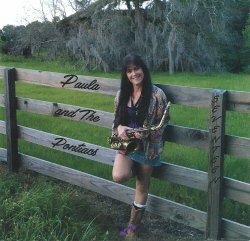 Over the years, Paula has always recruited top-flight musicians for the Pontiacs. As she recalls, “I once took a piece of paper and wrote down all the names of guitar players, bass players, drummers and piano players and there were 100 musicians that had been Pontiacs at one time or another..... And so it still goes!” Paula takes great pride in the contributions the Pontiacs sidemen have made to her music, and the bands that she assembled for the three albums from which this compilation draws its tracks testify to a woman who has a clear conception of how she wants her blues and R&B to sound and the ability to shape these bands to execute that conception. And, considering that she’s doing this in what is definitely a man’s world, it is genuinely admirable what this lady is putting down. In addition to her tremendous vocal and instrumental talents, 17 is a showcase for Paula’s songwriting, clearly exhibiting a way with words and a facility with shaping classic blues & R&B grooves to bring those words to life with maximum effect.